Been a while since we had a Hub Haps post. Not for a lack of haps, mind you, but just for all the effort going into the whole other blog I’ve been filling with original content every day: Maker Expo! Lots going on at the Communitech Hub, all the time, every day, and Friday was no different and especially tasty. INGU Solutions recently moved in as a tenant and said hello to everyone by serving up many gallons of Marble Slab ice cream complete with a counter full of toppings. at lunch. At left, on the scoop, is INGU’s CEO John van Pol. 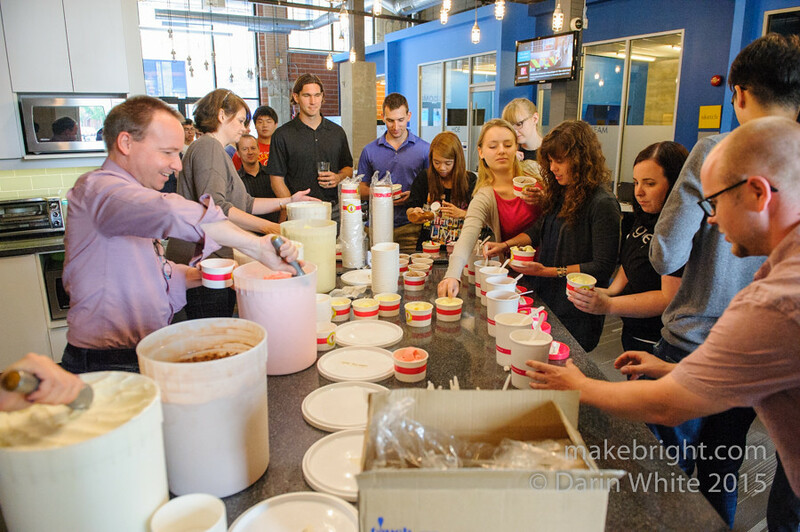 Beside him is Communitech’s Client Services Manager, Susan Brockhus-Strickler, doubling the ice cream delivery bandwidth. Thanks for the ice cream and welcome to the neighbourhood. This entry was posted in community and tagged HubHaps. Bookmark the permalink.